I just got my old Trek 7000 overhauled at ABC Bike's and I wanted to take it for a Sunday morning spin at the south end of St Pete Beach. 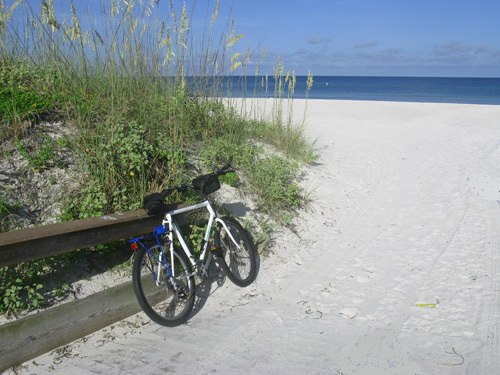 There is nothing more fun than a leisurely ride in Paradise to one of the many little breakfast spots along the beach. I picked up a lady friend, and we headed for Paradise Grill. 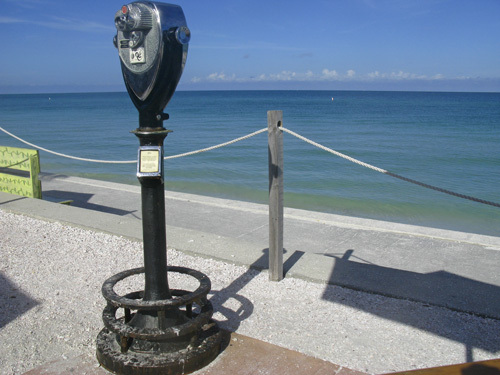 Eating at the picnic tables over-looking the Gulf, smelling the clean salt air, then going for a ride around the island is a nice way to start the day. We watched the community come awake as runners and standup paddle boarders arrived to take part in this wonderful July morning. Next, a few locals arrived to sample the great breakfasts at Paradise Grill. In about an hour, say 9:30am, the bike riding clubs would be pulling in after one of their fast pace-line jaunts along Gulf Blvd. The arts and crafts vendors out on the courtyard were already set up, ready to do a great day's business in the morning sunshine. 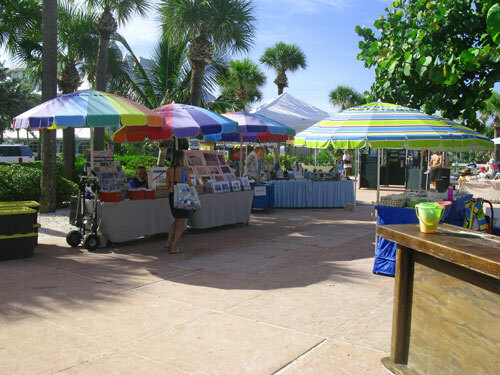 If I was not so involved with my Internet home business, I would seriously consider getting a booth, here. You'd be outdoors in a beautiful setting, you would spend the day relaxing and conversing with nice people, and you would be making good money. While we were waiting for our order, we started talking about a cool little Kindle book we had both read, called How To Make Money Online. It is just amazing how you can learn so much from reading a $3 book on your iPad. What resonated so much with me, is that I use this guy's approach. I run a variety a small websites that generate passive income. His premise is: get up to speed with 10 sites that produce just $500 each, per month...and you will be rolling in discretionary income...and having a blast while doing it. 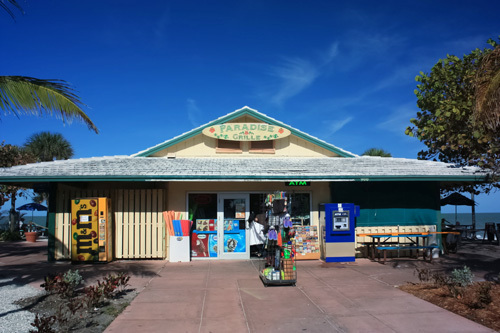 Combine living in Paradise with an online home business, and you can live the Florida beach lifestyle in a way that is fun, exciting, and one of ease. Here is something else, when you run a home based business, you are eligible for a huge amount of legitimate tax write-offs. Remember how I told you I just got my old Trek 7000 overhauled? Well, since it is one of my primary modes of transportation when I am out taking photos and gathering info for my different sites, the expenses I incur to keep it maintained are all tax deductible. I can't race it, and any time I am riding it, I'm thinking, "How can I turn this trip into a profit? "...so I am real legit. It beats walking all over sidewalks to get to different beaches, I can tell you that. I purchased a little $30 information book from HomeTaxBusters.com﻿, and it has saved me $1000's and $1000's of dollars over the past 12 years. Actually, it allows me use of an extra $500 of my own money each month. That's money that I earned, that does not have to go to countries who hate us, or welfare scammers who do not want to work. What could you do with an extra $300 - $500 of your own money??? I love retirement on the Gulf Coast. The mornings are uncrowded and unhurried. 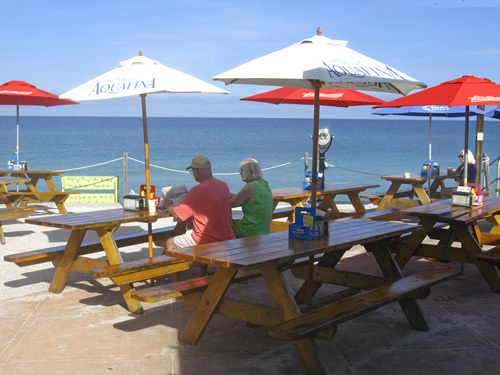 Sitting out back on the patio at Paradise Grill pretty much personifies the Florida beach lifestyle. Paradise Grill has one of those vintage binocular viewing machines from the 1950's. It still works, and still only costs a quarter. I hope this visit has made you think about your own retirement morning, and how it can be as good as God wants it to be for you.